Gluten free baking can sometimes be a challenge and it is something I shied away from until I discovered 1-to-1 gluten free flour. It takes all the guess work out of baking gluten free desserts since it perfectly formulated for baked goods and works as a 1-to-1 replacement for traditional flour. 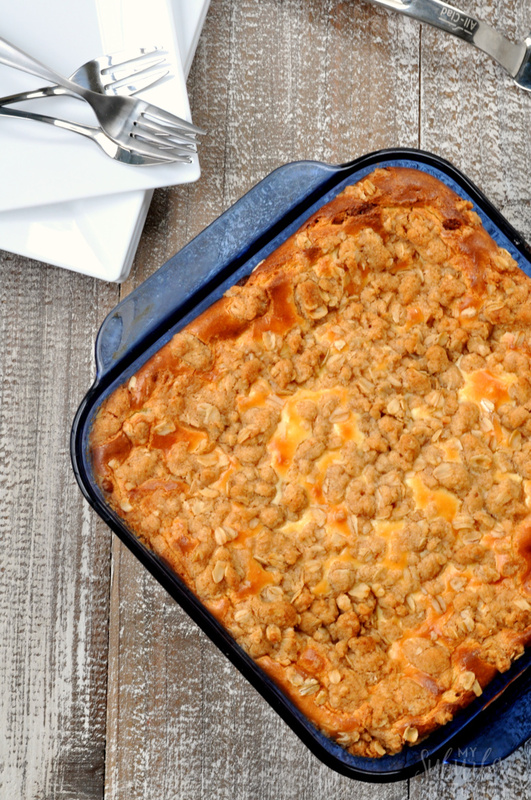 One of the key things to remember when making these cheesecake bars is to bring your ingredients to room temperature. That allows everything to mix better and results in an overall better quality carrot cheesecake. No one will ever guess that these delicious cheesecake bars are gluten free but everyone will be begging for the recipe! I took some to my office the day after I made them and everyone was instantly in love. I know my friends will be excited to discover a delicious gluten free cheesecake option too. If you want to make these and are not worried about gluten, you can easily use regular flour. However, to keep them gluten free, be sure to get a 1-to-1 gluten free flour. 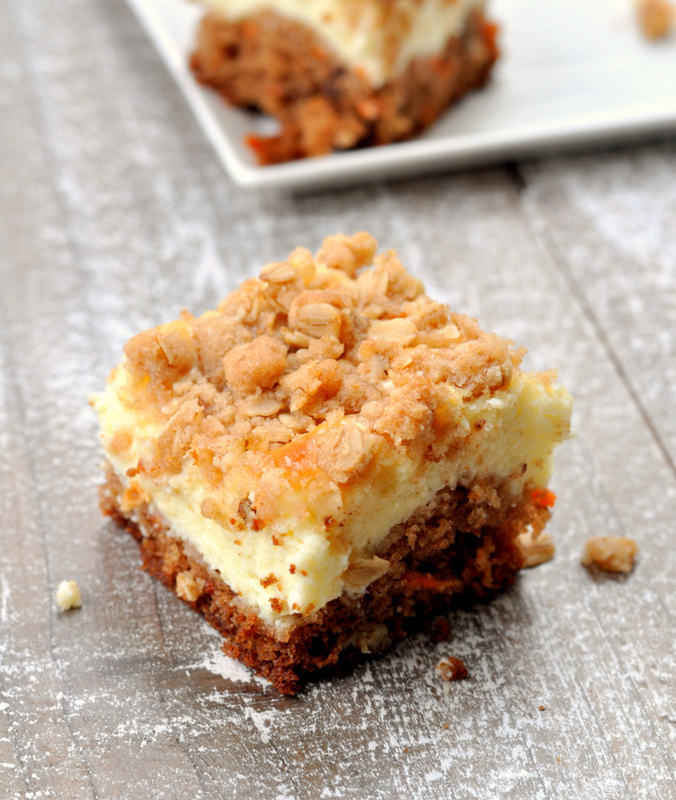 If you make these carrot cake cheesecake bars or any other recipe from the blog, I’d love to hear about your experience. Let me know in the comments or snap a photo and tag it #MySuburbanKitchen on Instagram or Twitter. Create the perfect gluten free cheesecake dessert when you make these gluten free carrot cake cheesecake bars. In a large bowl, combine 1 cup flour, baking powder, baking soda, salt, cinnamon, and nutmeg. In a medium bowl, whisk together butter, brown sugar and eggs. Fold into flour mixture. Stir in carrots and walnuts. Spread into bottom of ungreased 8x8 baking dish. Set aside. Beat together cream cheese, sour cream, 1/2 cup sugar until smooth. Beat in eggs, one at a time, until smooth. Pour mixture over cake batter in 8x8 baking dish. In a small bowl, mix together 1/2 cup Bob's Red Mill 1-to-1 Gluten Free Flour, oats, 1/4 cup brown sugar, cinnamon and butter until it forms a crumbly mixture. Spread over cream cheese layer. Bake in preheated oven for 50-55 minutes or until cheesecake is set. Remove from oven and cool for 30 minutes. Transfer to refrigerator and cool completely. Wow, this looks amazing. I love carrot cake. Pinning. Wow, these look absolutely delicious! I can’t wait to make these…my husband LOVES carrot cake and I’m a fan of gluten free! Always great to get a new gluten free recipe! 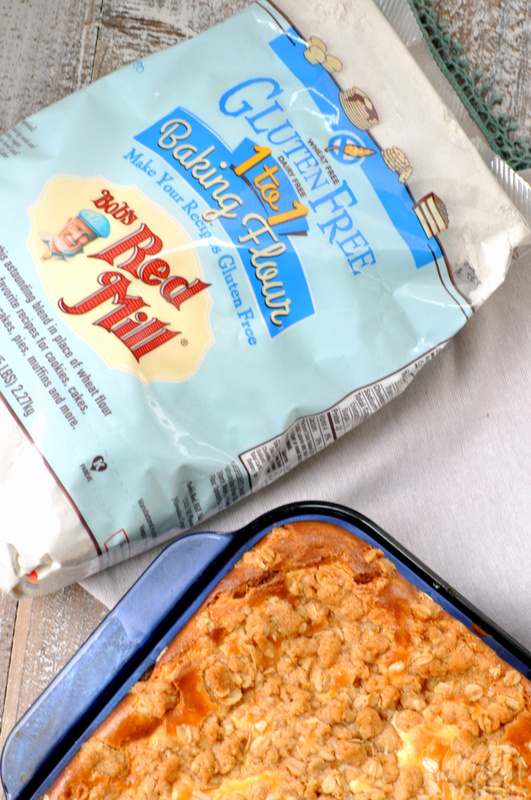 I actually went out recently and bought a lot of Bob’s Red Mill products that are gluten free. I bake a fair bit of GF food and write about it sometimes. But it’s easy to reach for the old standard regular flour when lazy. That’s why I figured I’d load up and make some better baking choices. I made these and they were terrific. You absolutely cannot tell that they’re gluten free. Delicious. I am so happy you enjoyed them. They are one of our favorites for sure! Oh these bars look so good! 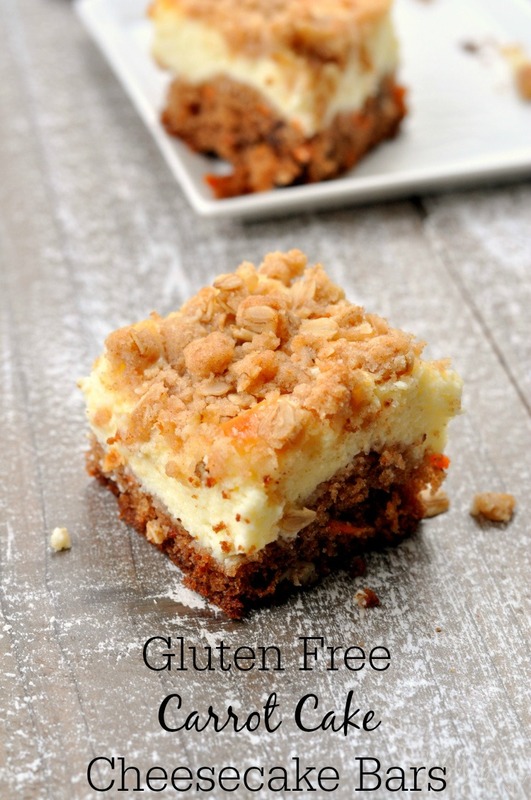 I adore carrot cake and love that you’ve turned it into gf cheesecake bars.